Submitted photo Wright State’s Deri Corfe keeps control of the ball as two Cincinnati Bearcats close in, Sept. 3 in Cincinnati. 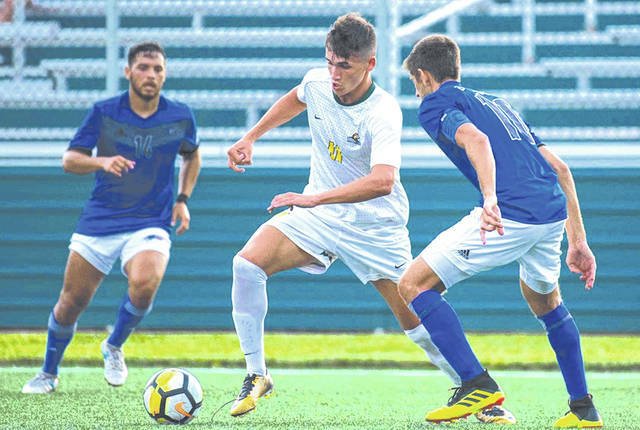 CINCINNATI — The Wright State Raiders men’s soccer team earned their third victory of the season, a 3-2 result, Sept. 3 against the Cincinnati Bearcats. Monday’s match was only seven minutes old when the first story line came to the forefront; the weather. A small thunderstorm cell passed over UC’s Gettler Stadium, causing a lightning delay for about 40 minutes. Once the match resumed, the Raiders did not waste any time mounting an offensive. A counter attack for the Raiders led to a misplay of the ball by Bearcat keeper Pearce Skinner, and Stefan Rokvic was in the right place at the right time to tuck the ball into the net, giving Wright State an early 1-0 lead in the 20th minute. The Bearcats seemed to be awakened by this early tally, as they mounted a charge of their own after the match opening goal. Minutes after Rokvic’s goal, Cincinnati took advantage of a wonderfully placed corner kick on the back post, and Mohamed Elmardi headed it past Joel Sundell to even the match at 1-all, where the score would remain going into halftime. Just seven minutes into the second half, the Raiders found themselves back in the lead. A low, driven shot from just outside the 18-yard box from Deri Corfe glanced off the far post and into the Bearcat net to give the Raiders a 2-1 advantage. Less than five minutes later, a corner from Corfe found teammate Alec Philippe for a headed attempt, and Philippe buried it to give Wright State a 3-1 advantage in the 57th minute. Goals off of set pieces continued to be a theme for the match, as 14 minutes later, the Bearcats scored off a Peyton Mowery header on a corner kick in the 71st minute. The latter stages of the match were frantic with the Bearcats trying to get the tying goal. UC was unable to put the final ball together, and the Raiders held on to earn their third victory in non-conference play. The Raiders will bring an unbeaten record into conference play, when it travels to take on the Northern Kentucky Norse, at 7 p.m. Saturday, Sept. 8. The match will be live streamed on ESPN3. For more information about Wright State athletics visit www.wsuraiders.com. https://www.fairborndailyherald.com/wp-content/uploads/sites/50/2018/09/web1_WSUmensoccer.jpgSubmitted photo Wright State’s Deri Corfe keeps control of the ball as two Cincinnati Bearcats close in, Sept. 3 in Cincinnati.